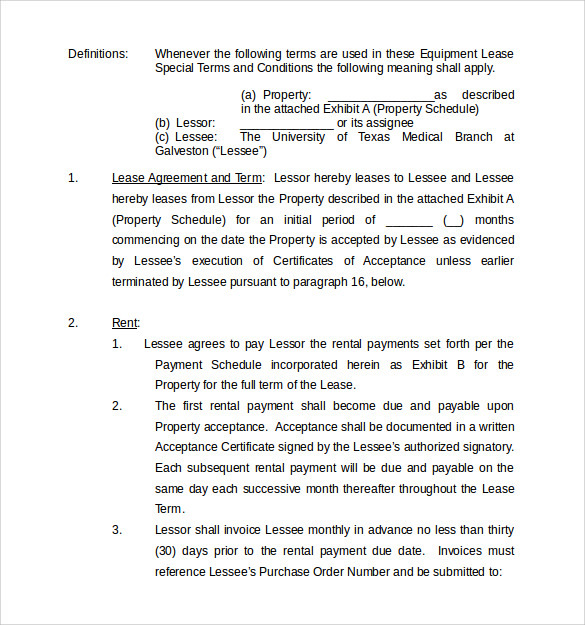 Equipment Lease Agreement is used to specify the conditions under which a person or organization can rent equipment from another person or organization. This agreement explains the rights and obligations related to equipment on which both parties have agreed. Details like the name of the company, person who owns the equipment, person who borrows the equipment, cost of equipment, duration of the lease, laws and rules, the responsibility of Lessor and Lessee and many other are to be mentioned in the agreement. 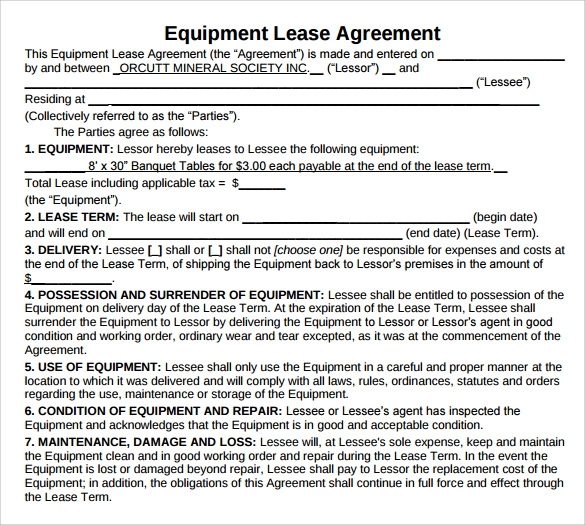 The equipment lease agreement word template can be of immense use when you are leasing equipment of any sort. 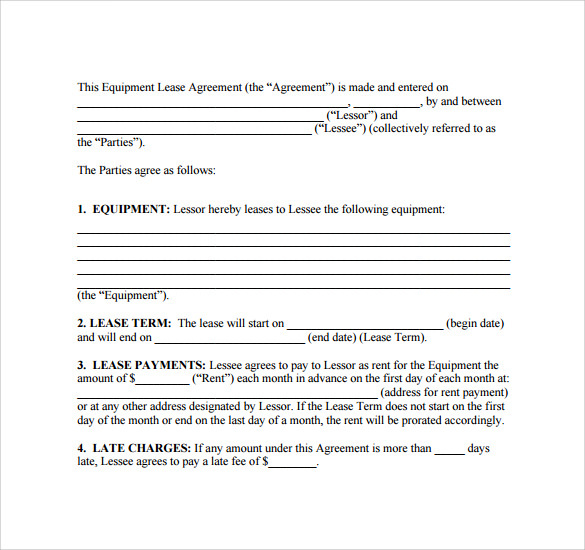 It is very easy to edit a word equipment lease template rather than creating a totally new lease agreement from scratch. 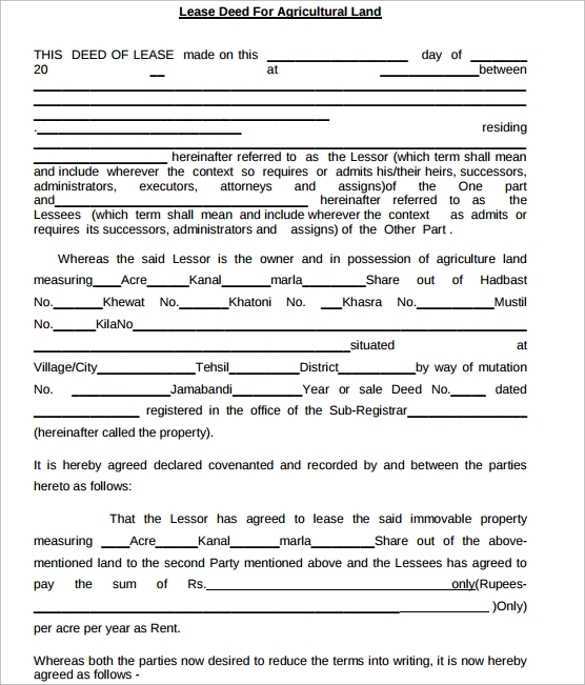 While leasing an agricultural land a lease agreement, a sample lease agreement can act as a guide to draft a new lease agreement for agricultural land. 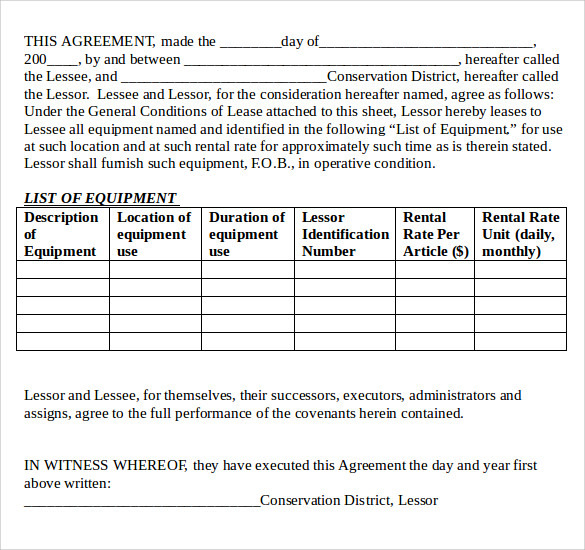 One can even avail a “ready to fill” samples lease agreement template. Sample lease agreement for a commercial property should consist of details such as – the name of the lessor and lessee, start and end date of the lease. And other terms and conditions. 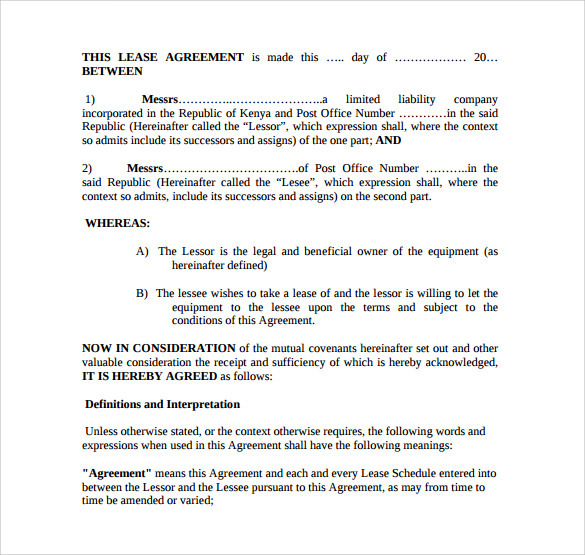 Lease agreements for commercial property can be more complex than that of residential property. Introduction of Parties– The parties should be clear about who is a Lessor and who is a Lessee. 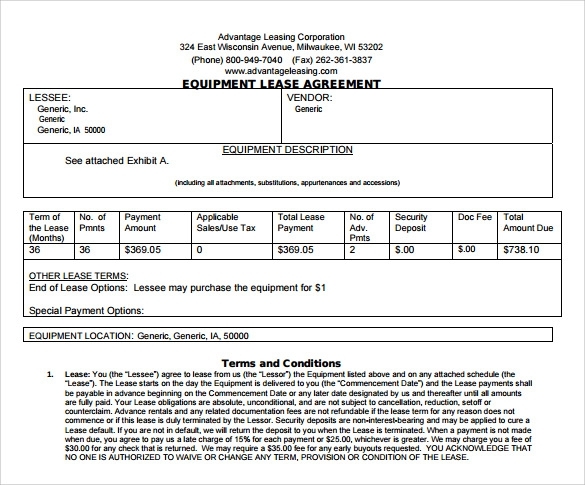 The Lessor is the party that is leasing the equipment to the Lessee. 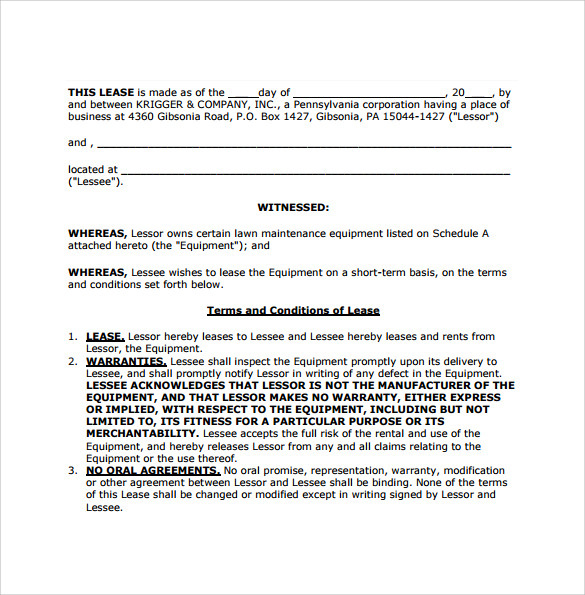 Lease Terms– the time period during which the Equipment is leased is called the Lease Term. Lease Payment– Lease Payment is the amount on which Lessee agrees to pay to Lessor as a rent of equipment. This amount should be paid as an advance of each month as decided. Late Charges– if the Lessee are unable to pay the amount of time then they have to pay late charges as decided. Security Deposit– this is optional provision. 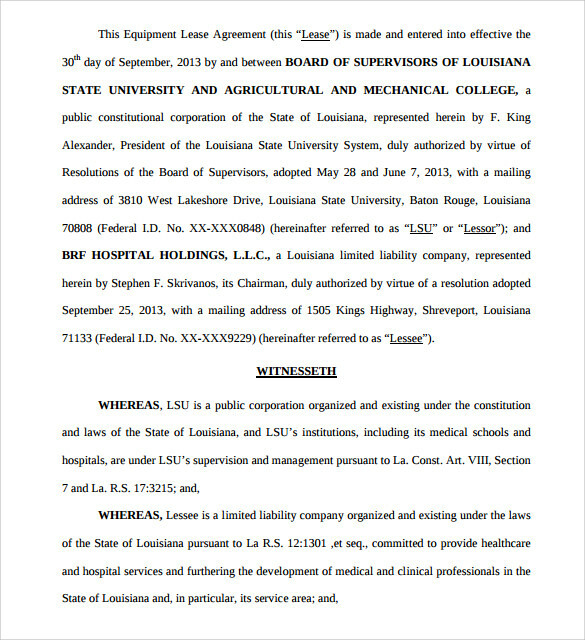 Here, Lessee agrees to pay a deposit to the Lessor in the beginning as a guarantee of the conditions of equipment. This security amount is supposed to be returned to the Lessee if the equipment is still in good condition. Ownership– it is mentioned that equipment is still the property of Lessor though Lessee uses it in its business. Defaults– there are some events which are considered as “Event of Default” by the Lessee. It means that if Lessee mentions a thing as “Event of Default”, Lessor can walk away from the lease. Taxes and Fees– it is the responsibility of the Lessee to pay all the taxes and fees of the equipment during the lease period. One copy should be given to Lessor as proof. 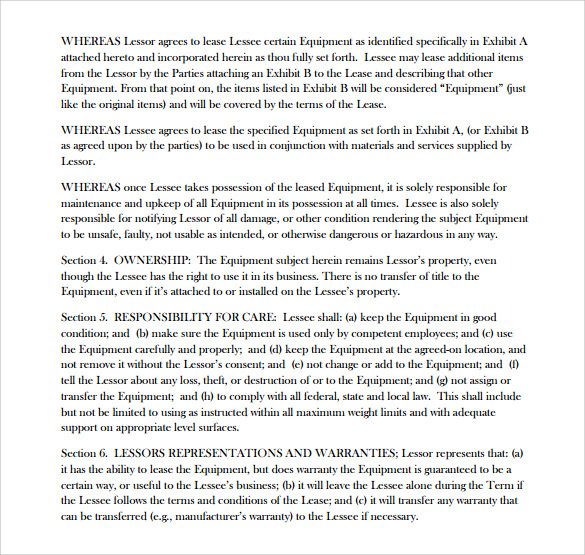 Above listed are some of the major attributes which need to be included in any Equipment Lease Agreement. Before signing the agreement, it requires both parties to read and understand the written statement carefully in order to avoid any future conflict. 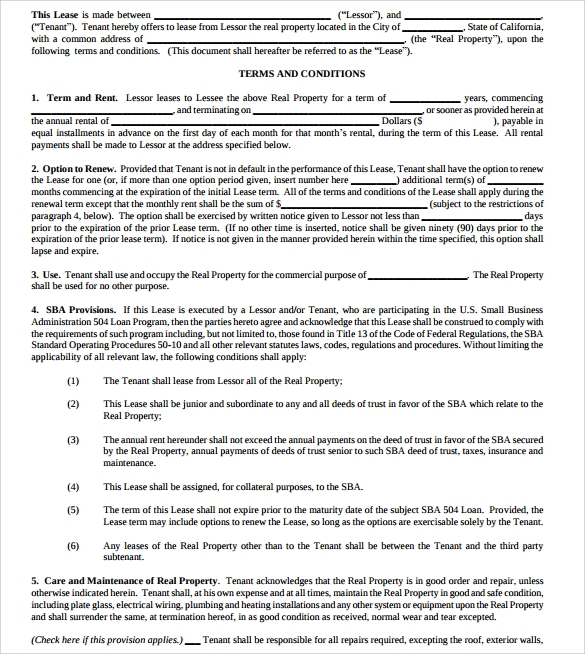 Sample lease agreement templates can save your time and efforts. Also, using a ready-made template form us will ensure that you have covered all the essential details. 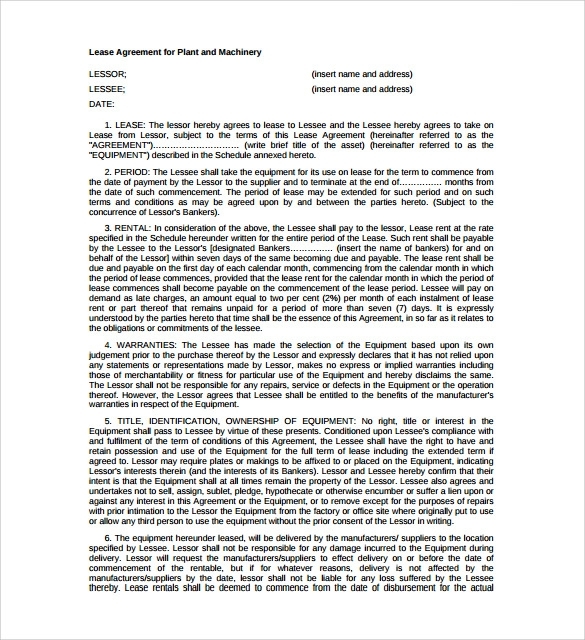 Sample equipment lease agreement templates are widely used amongst the equipment buyers and sellers.